KPJ is primarily a hospital operator. It has 25 hospitals in Malaysia, including KPJ Tawakkal in Kuala Lumpur. KPJ Healthcare Bhd is in advanced talks to sell its stake in loss-making Jeta Gardens, an aged care centre and retirement village in Queensland, Australia, to an Australian party that is in a similar line of business, sources say. “It is a party of Australian-based investors that they are talking to. It is likely that a deal would be signed once the buyer is able to raise financing for the purchase [of the stake and the property],” a source familiar with the matter tells The Edge. KPJ owns a 57% stake in Jeta Gardens (QLD) Pty Ltd, which operates the business. Al-’Aqar Healthcare Real Estate Investment Trust, in which KPJ has an indirect 39.25% stake, owns the property. Hence, the proposed disposal of Jeta Gardens will involve both KPJ and Al-’Aqar. If a deal pans out, KPJ will receive proceeds from the sale of the stake, while Al-’Aqar will receive proceeds from the sale of the property. KPJ, when contacted, declined to comment. Its major shareholders are Johor Corp Bhd, with a 43.61% stake, and the Employees Provident Fund with 12.69% equity interest. In 2011, KPJ paid RM19 million cash for a 51% holding in Brisbane-based Jeta Gardens, already loss-making at the time. The rest of the stake was held by the Australian founder of the business, Tan Choe Lam, and a group of local investors. Over time, KPJ raised its stake to 57% and pumped in more money to expand the capacity at the aged care centre. 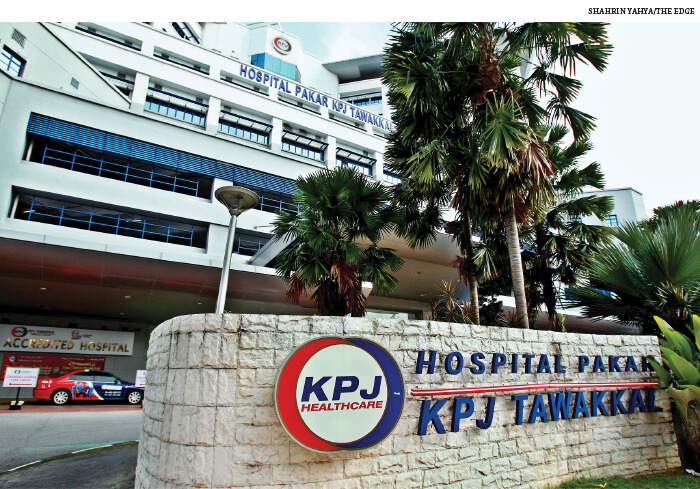 In FY2016, KPJ marked down its investment cost in Jeta Gardens to about RM16 million. Al-’Aqar, meanwhile, listed the property’s fair value at RM142.56 million in its 2016 annual report. If successful, the sale would mark KPJ’s exit from the aged care services business in Australia. However, it will continue to operate two centres in Malaysia — KPJ Senior Living Care (SLC) at the Tawakkal Health Centre in Kuala Lumpur, and Love Care Centre in Sibu, Sarawak, adjacent to the KPJ Sibu Specialist Hospital. In the overall scheme of things, these are very small businesses to KPJ, which is primarily a hospital operator. SLC, for example, registered a gross operating revenue of just RM1.9 million in FY2016. Whether KPJ will go bigger into the aged care business at home remains to be seen. According to a source, this will depend largely on upcoming legislation around aged care facilities. The Private Aged Healthcare Facilities and Services Bill, proposed by the Ministry of Health to ensure higher standards in the aged care industry, reached the second and third readings on Oct 24 last year. “The legislation for aged care will likely be presented in the coming Parliament session,” the source says. Margins in the aged care business in Malaysia are thin and there is no proper funding mechanism for those that require such care. “Private insurance, for example, does not cover the stay in such facilities at the moment, and neither are there social security benefits that would entitle old folks to at least a subsidy — so those are the biggest problems for such businesses,” the source adds. Once the bill is passed, among others, all aged care facilities with at least four residents must register with the government and adhere to a minimum standard for services and charges. KPJ’s investment in Jeta Gardens in 2011 was, in fact, for the specific purpose of acquiring the technical know-how to run an aged care facility. That KPJ plans to sell Jeta Gardens now is no surprise. While the former has managed to narrow the latter’s losses over the years, the business would require further investment if it is to turn around. It is understood that KPJ is not prepared to pump in more money as it wants to focus on the expansion of its domestic hospital business in the short to medium term. Over 90% of the group’s earnings is generated in Malaysia. In Australia, KPJ reported a loss before zakat and tax of RM5.69 million in the first nine months of FY2017, compared with a loss of RM8.09 million in the same period a year ago, as a result of better economies of scale at Jeta Gardens. MIDF Research, in a Jan 3 report on KPJ, said the company’s management had indicated that it was in an advanced stage of disposing of Jeta Gardens. There were, however, no details on the price or potential buyer in the report. According to the research house, Jeta Gardens will be sold at net tangible asset value, and the proceeds will be recognised as a gain on disposal. It said the disposal would only be completed in the first half of FY2018 following an extraordinary general meeting next month. “We are positive about the fact that KPJ has decided to exit Jeta Gardens as … it is showing no sign of turning around anytime soon. This is despite the continuous effort by the management to turn around the operation, including adding more capacity to the facility in 2015. “Furthermore, we believe the management will be able to use the proceeds from the disposal to pare down debt and reinvest in expanding existing hospitals, which will benefit KPJ in the future,” says MIDF Research. KPJ has 25 hospitals in Malaysia, two in Indonesia, and a passive stake in a hospital in Thailand. It has a hospital in Bangladesh where it is merely the operator. Analysts say there will be more asset disposals to come as KPJ looks to pare down debt and manage its cash flow better. KPJ’s gross debt stood at RM1.589 billion as at end-September last year. Just last month, KPJ announced that its 60%-owned subsidiary, Selangor Specialist Hospital Sdn Bhd, will sell a five-storey car park block at the KPJ Selangor Specialist Hospital to Al-’Aqar for RM13 million. The proceeds are to be used to pare down debt at that hospital. “You’ll see more hospital assets being sold to Al-’Aqar from FY2019. I think it’s a good thing as it helps them clean up their balance sheet and boost profit,” an analyst says. KPJ’s net gearing stood at 0.71 times as at end-September, which is on the high side compared with its peers. Among the hospitals that could be sold to the REIT from FY2019 onwards are KPJ Pasir Gudang, KPJ Sabah, KPJ Bandar Maharani, KPJ Rawang and KPJ Selangor (consultant suite), says MIDF Research. For the first nine months of FY2017, KPJ’s net profit rose 4.11% to RM101 million, coming in below analysts’ expectations as it accounted for only 63% of consensus’ full-year earnings forecast. Some analysts, however, are optimistic that the group’s operations are poised to pick up in FY2018 given an improvement in patient volume as new hospitals open, and a potential new round of price revisions that could take place this year. According to MIDF Research, KPJ Perlis is expected to be ready for operations sometime this month, while other hospitals expected to be opened in FY2018 and FY2019 include KPJ Bandar Dato’ Onn in Johor, KPJ Kuching, KPJ Miri and an expansion of KPJ Sabah. The company’s share price, which was down 5.55% last year, closed at 98.5 sen last Friday. Bloomberg data shows that of at least 17 analysts who track the stock, most (10) have a “hold” call on it, while six have a “buy”, and one, a “sell”.